Plumbing Companies Round Rock | Bio-clean: What is it? If you haven’t already noticed, our Round Rock plumbers are constantly recommending Bio-Clean to our clients. But why? Mojica Plumbing & Drain Cleaning really does care about the health of your plumbing system, and we’re always recommending products and services that will only help to prevent future problems. Bio-Clean is one of our favorite products. If you’re curious about this substance and why we use it so often, hopefully, this brief introduction will help. Bio-Clean is an enzymatic solution that’s applied to pipes and drains to prevent the buildup of bacteria and solids. In most cases, it’s mixed with some warm water and poured into the drains where it adheres. Bio-Clean, interestingly enough, is a solution composed of naturally occurring bacteria and enzymes, both of which have similar roles in nature. They exist in your drains and decompose the solids that often cause your drains to clog. While this might seem dangerous and caustic, it isn’t! Again, the enzymes and bacteria are found in nature, where they decompose waste. It’s almost a no-brainer that they’re used in drains! Bio-Clean can do quite a few things, like dissolve solids and prevent odors from forming. The solution is good on both the commercial and residential level given how powerful it is. 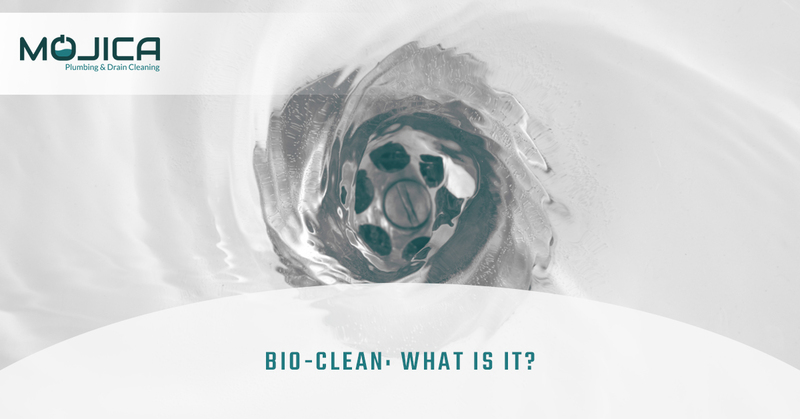 Some applications of Bio-Clean that we’ve seen are kitchen and bathroom sink drains, garbage disposals, shower and bathtub drains, septic tanks, outhouses, and sump pumps to name a few. Does it dissolve all solids? Unfortunately, no. Because Bio-Clean is composed of substances that are found in nature, it can only degrade substances and clogs that are biodegradable. While it will break down grease, food, waste and even hair, it won’t be able to break down something like a plastic cap. That being said, things that aren’t biodegradable shouldn’t be anywhere near your drains! This includes harsh chemical drain cleaner. Could it harm the environment? We said it before and we’ll say it again—Bio-Clean is made from naturally occurring substances, so it won’t harm the environment. In fact, it’s rather good for the environment because it breaks down waste and solids before they’re processed by the septic system. This helps to reduce the amount of energy needed to clean the water. Most drain cleaners, though, are awful for the environment, so we don’t suggest using them! Mojica Plumbing & Drain Cleaning is a huge proponent of Bio-Clean, and we recommend it to all of our customers. Usually, we’ll apply a layer when we do plumbing work on your house, but you could use it on your own! Next time you call our plumbing company for a repair, replacement, or installation, inquire about Bio-Clean. We’ll give you advice that depends on your own plumbing system. Our Round Rock plumbers are passionate about the environment. We always want to make sure that the work that we do is both safe and effective. For an appointment, call Mojica Plumbing & Drain Cleaning today!